Oceanview Private Vacation House, Convenience Location! A special lanai that faces the ocean providing stunning ocean views, 5 minutes to downtown Hilo, 10 minutes to Hilo Airport. Beautifully-furnished cottage,The first floor has entrance to a hall .A spacious living room overlooks the lanai and ocean view through glass doors. The comfortable bedroom has a special lanai that faces the ocean providing stunning ocean views. The room provides breathtaking views of the sun rising out of the Pacific Ocean. Guests can use all common areas and lanais. A 10-minute ride from the Hilo International Airport will take you to our conveniently located property. The downtown area is only five minutes’ drive away if you want to feel the hustle and bustle of Hilo. It will take 10 minutes to drive to the University of Hawaii at Hilo and the Imiloa Astronomy Center if you would like a cultural and educational tour. The numerous natural scenic spots can also be reached quickly. For example, the Hawaii Volcano National Park is just half an hour’s ride away. The bedroom is equipped with hotel-standard facilities: two comfy full-sized beds with cotton and silky bedding, a ceiling fan, a closet, a dresser, a nightstand, a table, chairs, etc.. The bathroom is furnished with one toilet, sinks, and a walk-in shower. Feel free to use the shampoo, hair conditioner, body shower gel, liquid soap, hair dryer, bath towels, and even beach towels. When you sitting on living room,You almost feel like touching the "Princess Pride Of America" Cruise Ships coming & going! Absolutely Stunning! Breathtaking Ocean View!! !Excellently maintained home at bottom of priv. Road in Wainaku. Tropical Landscaping compliments vast Ocean Panorama!! Family-oriented Neighborhood! 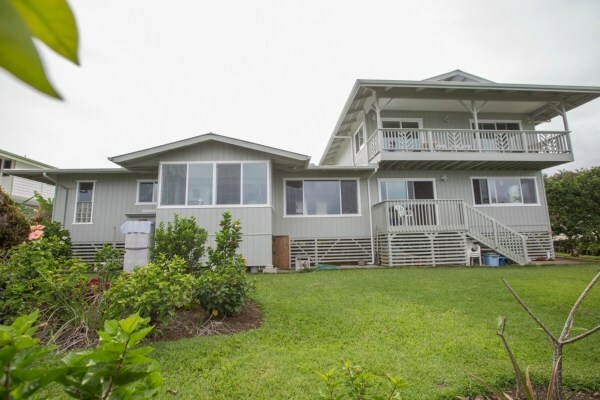 Walk to Honolii Surfing Beach, Haaheo School, convenient to down-town, Post Office, Restaurants, Parks, Banks, Churches, Hospital, Mall!! Beautifully-furnished cottage,The first floor has entrance to a hall .A spacious living room overlooks the lanai and ocean view through glass doors. The comfortable bedroom has a special lanai that faces the ocean providing stunning ocean views. The room provides breathtaking views of the sun rising out of the Pacific Ocean. Guests can use all common areas and lanais. Due to unsatisfactory sound insulation of the rooms, please keep quiet between 21:00 and 6:00 to guarantee sweet dreams for both you and us. When in Hawaii, do as Hawaiians do. Shoes aren’t worn inside at most Hawaiian homes, so please leave your shoes outside the house door. And our kitchen is not open to guests, but you may use the refrigerator for small quantities of perishable foods. A $100 replacement fee will be charged for a lost key. Please keep the common areas clean. No smoking in the house or on lanai. 5 people up, add $ 30 per person.